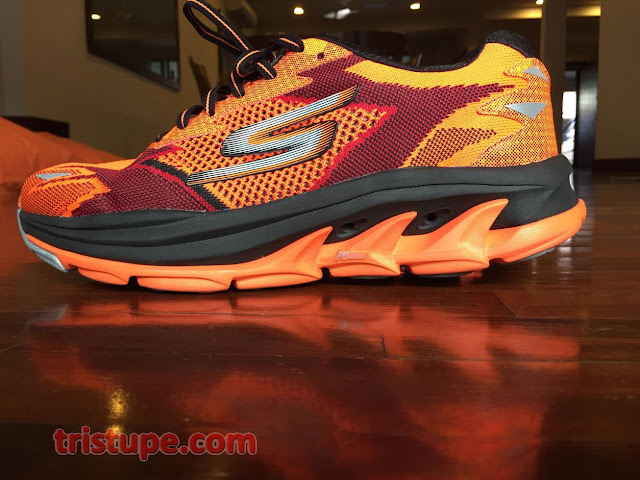 The mighty cushioned shoe from Skechers Performance (Malaysia) has just gotten better in the form of GoRun Ultra Road (GRUR). An iteration of the proven GoRun Ultra, which is very much a shoe made for the trail and occasional road; I called it hybrid and indeed it has served me very well until today (my 3rd pair of GRU now). Those of you that has been using GRU would know that this shoe range (the Ultra) is bulky by Skechers' standard. However, despite the outlook, it's light and super flexible. 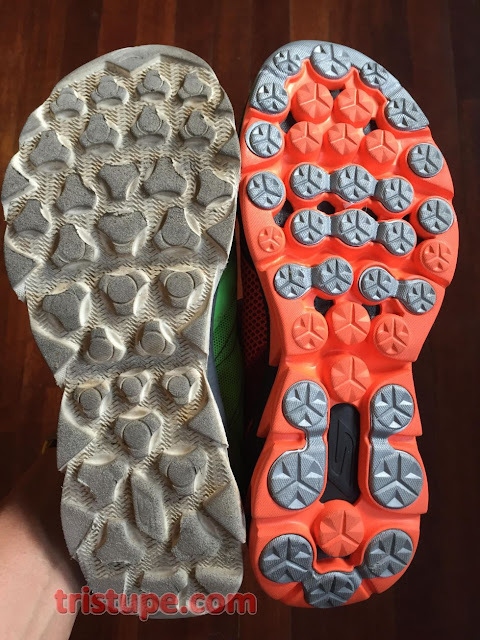 Those of you using them would also know that the sole doesn't hold up too well "on the road". Throughout the 3-years I've been on Skechers, I have also learnt that while the wear could look excessive, it doesn't effect the performance of the shoe (grip and cushioning). My 3rd Pair of GRU has clocked no less than 400km and still clocking in the mileage. The new GRUR now come with a completely new outsole said to help it last the road pounding. Now to the usual way of me doing a shoe review. First off is the fitting of the shoe. GRUR carry on the fitment of the GRU. Wide toebox and i took US11 as my feet seemed to had grown over the past two years (hopefully not because I gained weight and the feet spreading out more to hold my weight). I have intention to use this shoe without socks (as usual) and the liner that comes with it should provide sufficient space if I choose to use socks. Over the years I've collected different liner from different Skechers shoes as well. The GRUR is a 4mm drop shoe. Stack height of 30mm on the heel (tall!) and 26mm on the front. Removing the liner doesn't make the show decreases in drop. In comparison, one of the more famous cushioned shoe has a stack height of 33mm-29mm (Heel-Front) and still has a 4mm drop. (if you guessed Hoka One One, you are a shoe-aware person). Similar persona between GRUR and GRU when it comes to Cushioning. Being a bulk of a shoe meant the GRUR too will be heavier than it's other cousins. Coming in at 10.4oz (295grams) for US9, my US11 clocked in at close to 330grams (approx 11.5oz). As heavy as it may appear, the cushioning and the ride more than make up for it. If you are a heavier person (I would say more than 85kg), you will find this shoe very forgivingly light with the cushioning. 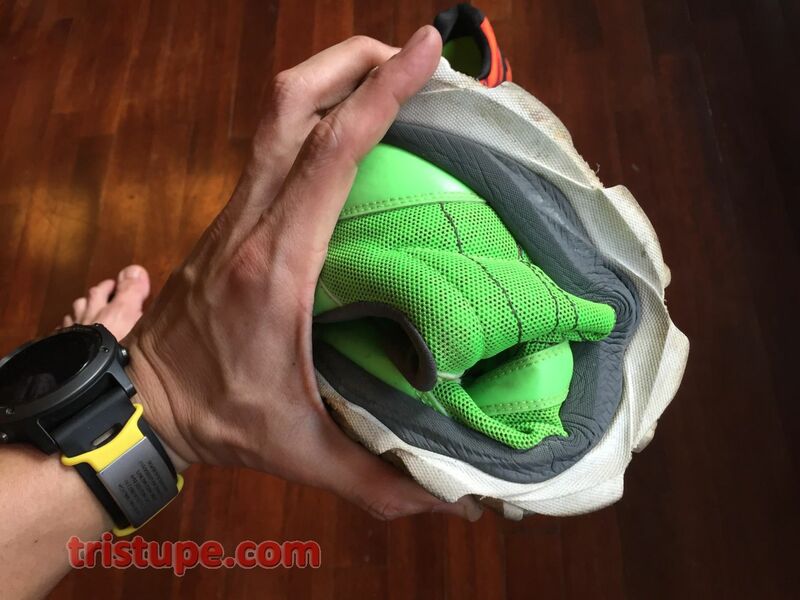 (Shoe-aware runner - do you know which make and model comes in at approx 390grams to suit heavier runners? It's named "The Beast" by Brooks). Does the weight bother my average weight (73kg)? Hardly. In fact, for the bulk (read:size) and weight, the shoe felt snappy and and doesn't seems to give you the sinking feeling. On some occasions, the cushioning gives the perception that it feel sloppy...but you aren't once you realised you are still running at your normal training pace. Deceiving. The newly designed sole of the GRUR is made up of Resalyte material. The midsole material is plush and provides a nice soft landing . 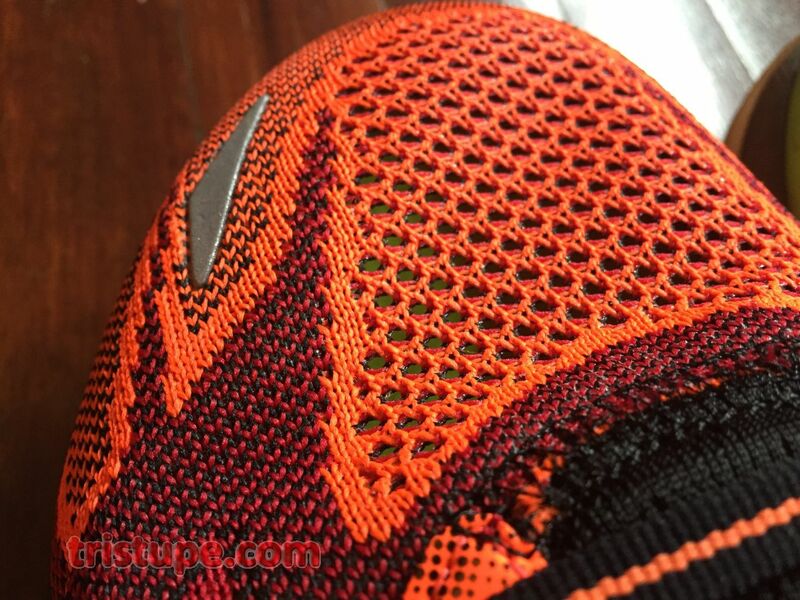 The Outsole layer is a much firmer and resilient material. The design of the outsole works around the existing GOrun series and is much firmer (when I compare to the GoRun4 and GoBionic2, but not as firm when compared to GoMeb). The more resilient GOimpulse sensors were placed strategically around the outsole for added durability. Testing it, the Pods provide good traction and feel as well. The GRUR is a complete revamp of the original GOrun Ultra. The upper of the Skechers GOrun Ultra Road is designed with the Skechers Performance FITKNIT® technology providing a breathable and comfortable fit. It is completely knitted upper without any overlays and seams, save for the bonded logo on the side. It's completely runnable sock-less, which is what I usually do. Apart from the different material upper, there are two drain holes noticeable on both the sides. I supposed it is to help with draining of water should you get your feet into puddle of water or if you happen to take a shower at the water station. My thoughts on this is that it may help dispersing water out of the shoe. However, it will also encourage water from going in... so you may want to avoid running into puddles of water if you don't like your shoe (or socks) wet. The drainage hole looked crude from this photo due to the glue that was used to stick the mesh. The GRUR comes with FITKNIT® upper. You may had read about it in my review of GRR Bolt where I even ran a water-holding (or lack off, which was a good proof that the knit doesn't hold water) experiment. Interestingly, the GRUR has two knit "density" as opposed to GRR Bolt. The knit was a lot more "closer" in the support area to provide structure and it is "spaced out" in areas where breath-ability is required like top and side. The dual-knitted density itself lend the GRUR a very distinctive look. The tongue was thick and is not sewn down. There was initial worry it may bunch up but that was an unproven concern after using it for a few runs. Maybe there is opportunity to reduce the thickness of the tongue to shave off some grams and lend even better (as if not airy enough) breath-ability? Safety wise, the GRUR comes with reflective marking on the front and back of the shoe, and on the tongue where it allow shoelaces to tread through. Sufficient enough, but I would encourage you to run with lights front and back if you are the nite-runner or early morning type. Better be safe than sorry. The GRUR doesn't dissapoint either... convincing enough despite the new material upper and sole! Note: This pair of Skechers GoRun Ultra Road is sponsored by Skechers Malaysia via collaboration with 2ndSkin Asia Athletes program. 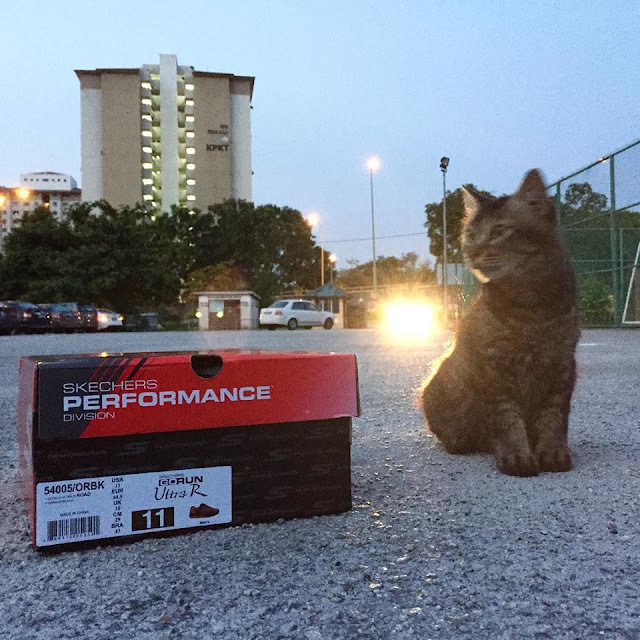 Thank you Skechers Malaysia and 2ndSkin! This pair is launched this week (today!). Retailing at RM499 for men and RM469 for women (Semenanjung). RM10-20 more for East Malaysia. Opinion in this write up is my own and not influenced by Skechers Malaysia or 2ndSkin program.